Have any of you gone back to your college campus and just felt…..old? I remember going to the UCSB campus with Jeff when we first started dating, almost four years ago. I was so excited, since I hadn’t been there since graduation. Mind you, at this point it had only been a little over a year since I had graduated. And yet, things felt so weird. For one, you no longer have the same connection to the campus. It’s not your campus anymore, you’re not walking to class, or rushing to work at the poli sci department, or going to some club meeting. Nope, you’re just a stranger walking by, an alumni trying to relive your glory days! What weirds me out the most is how old you feel by it. I honestly don’t “feel” very different from one I graduated, or for when I started college, for that point. But I look at college kids these days and they just look so darn YOUNG! In my mind, I’m not that much older, not that much more mature (weeeeeeeell, this one can be argued), not that much different from where these college kids are in their life, and yet, I am. It’s a crazy realization, huh? Here’s what I love about bridal showers, bachelorette parties, baby showers, etc. 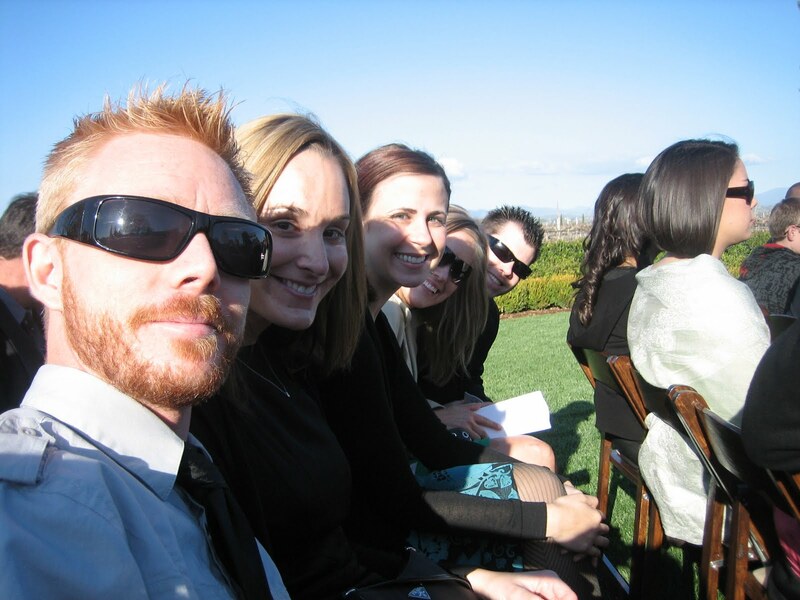 : you get to meet the different groups of friends of the person being celebrated. 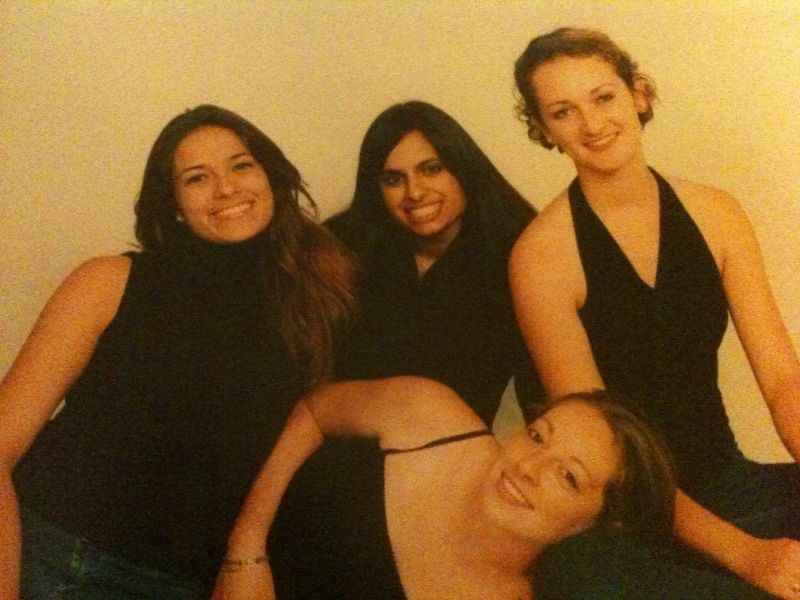 For my wedding festivities, there were the high school friends (Bhavini, thank you for representing! ), the undergrad grup, the law school group, the Starbucks group, the work group, etc. It may cause a little bit of an anxiety attack to think of all these groups meeting, and wondering how they will mingle, but it’s also absolutely amazing to see all of your closest friends, from all walks of life, together in one place. I remember the days, and I remember them well. I had made it through the initial stages of waking up, pulling some clothes over my head, pretending to brush my teeth, getting my backpack ready, and finally making my way to the kitchen. Drag my feet over to the pantry…pull out the cereal box…a free mini pez dispenser! A free super duper cool spoon! A free watch, action figure, trading card, or sticker! The possibilities were endless. And my excitement, extreme. I’m not sure when it happened, but they stopped giving toys in cereal boxes. I’m sure it was because of a choking hazard or something, but the point is, they took away my cereal toys. And now, almost two decades later, they want to take away my happy meal toys. 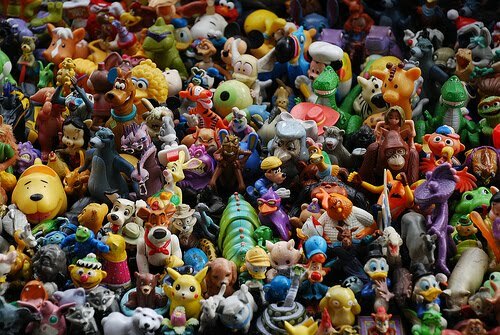 The argument is “that using toys to entice children instills bad eating habits and puts kids at higher risk of risk of developing obesity, diabetes, or other diet-related diseases over the course of their lifetime.” Well…maybe, but that’s why you have parents, right? To say, “no, no happy meal today,” or “no, we’re getting apple slices instead of fries,” or “no, we’re eating dinner at home today.” I mean, since when is McDonald’s supposed to be a regular part of a kids diet? Not gonna lie, one of my favorite parts about Sundays was going to McDonald’s after church. Because that was the only time we had it, if at all. It was called a special occasion, not a daily dinner. I know people may have more hectic schedules these days, with most homes having both parents working and therefore less time to cook at home, but there are other alternatives to having McDonald’s four times a week. What are we all going to do now without the worthless pieces of plastic and paper? What are we supposed to fill our car side doors and random shelves with now? What are you supposed to sell for ten cents at garage sells? And how on EARTH can you call a Happy Meal a Happy Meal without a toy inside? We’re doomed, I tell you, doomed. Abby and I were wandering the halls of the Miami international airport, our last stop before boarding a plane to Haiti. We had a bit of a layover, and I really wanted to find something worth reading. I perused the bookstore for quite a bit of time, hoping to find something cheery and uplifting. I knew I was headed to a county that had been devastated by January’s earthquake, so I didn’t want something that was super serious or a “downer” by any means. 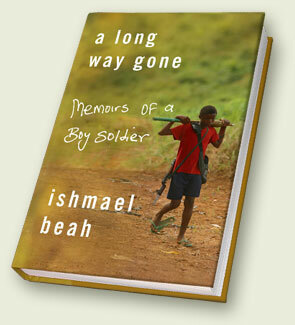 With those search criteria in mind, I came across “A Long Way Gone: memoirs of a boy soldier,” by Ishmael Beah. How’s THAT for a light read? I held on to that book for a while as I tried to find something “lighter,” but nothing else really caught my attention, and I really had been wanting to read this book for a while. So the memoirs of a boy soldier it would be. I’m a little torn on my review of this book. I think it gives a good account of what children soldiers have to go through, how they get where they are, and how they’re able to carry out the orders they’re given (which I know I didn’t really understand before reading this book). The book gives a good first account of someone who has had to live through horrific and terrifying scenes, scenes which most of us can never even imagine. I think my only criticism is that the author is simply telling his story, and I was wanting to read something “more.” The author’s purpose is to tell his story, not necessarily to win a Nobel Prize in Literature. He’s not concerned with the flow of the book, or embellishments, or making sure things sound good, he is concerned with letting the world know what he had to live through. I think the book is exactly what you expect, and not much more. Like I mentioned before, it wasn’t quite the book I was in the mood for, but I’m still glad I read it. It’s a good read, especially if you’ve never read or heard about children soldiers, but in the words of a good friend, it’s “not overly insightful or surprising.” I would still give this book a read if you’re in the right mood for it. Well, it seems Guatemala can’t catch a break. Faithful readers may remember some prior blog entries where I mention the CICIG, the Commission Against Impunity in Guatemala, and the work of it’s director, Carlos Castresana. For whatever criticism Mr. Castresana and the CICIG have gotten, no one can deny the fact that more has been done in the past two years by Mr. Castresana and this organization to fight crime and corruption, then in anytime since the end of the civil war. It was with a heavy heart that I read news earlier this week announcing Mr. Castresana’s resignation from the CICIG. From what I read, Mr. Castresana was frustrated with the lack of cooperation from the Guatemalan government, and stated that he could do no more for the country. The tipping point, apparently, was the appointment of Conrado Reyes as Attorney General, an individual whom Mr. Castresana believed was linked to organized crime. Alvaro Colom, the president of Guatemala, disregarded Mr. Castresana’s concerns and appointed Mr. Reyes anyway. It’s interesting, however, that days after Mr. Castresana’s resignation the Constitutional Court of Guatemala handed down an ruling in which it ousted Mr. Reyes from the position of Attorney General. Colom is not disputing the ruling. Huh. In a speech given to the press regarding his resignation, Mr. Castresana praised the success of the commission so far, giving a briefing on what they have accomplished so far, and what he recommends still needs to be done. He also stated he will be staying on board until a replacement is found. Personally, I’m very sad to see Mr. Castresana go. He’s one of the first people that I have seen talk about the issues and problems facing Guatemala without holding back: he was not afraid to name names, and to call out people who were before untouchable. His replacement has big shoes to fill, and I wish them the best of luck. I had the honor of attending a good friend’s college graduation yesterday (congrats Julian!). I say it was an honor because it was one of those graduations where they limit the amount of people you can invite (which is ridiculous, and I’m glad that didn’t happen at mine-my family would have been up in arms), and I was lucky enough to be included with the family and Brookie. Anyhow, I digress. We had managed to get through the parking situation, finding the location of the graduation, finding our seats (yes, there were actually assigned seats), remembering that we wanted to pick up a couple programs, adjusting camera settings to make sure we captured all important and non-important moments in the correct lighting, and starting to “observe” what everyone else was wearing at said event. I was taking some intro pictures to the stage and set up, and all of a sudden it hit me: it’s been five years (pretty much to the day) since I graduated from UCSB. Holy crap. Five years. I tried to remember what was going through my mind as I graduated that fateful day, five years ago. What was I hoping to accomplish in life? What did I want to do with my life? Have those thoughts changed at all? What I could remember, and very clearly, was how I felt, physically. Definitely hung over. I remember napping on Sheena’s shoulder during someone’s commencement speech. The night before we had celebrated Ana’s birthday, as well as our Chicano/Latino Graduation. My mom and grandmother had come into town that day and were staying at my place. Needless to say, a little more than awkward to stumble into my own apartment at 4 a.m. with mom and grandma sleeping in my room. Ah…college. I honestly don’t know what I wanted at that point in my life. Law school had crossed my mind, but not seriously. I was excited to move back home. I wanted to find a job. I was afraid of jumping into the real world. Sometimes I think I still am. I can’t believe how quickly life passes you by. Five years have come and gone, and although I’m extremely happy with what I’ve done in those years, there’s so much more I still want to accomplish with my life. I hope the next five years are as productive, if not more, than the last five. The last couple weeks have been a little rough in Guatemala. 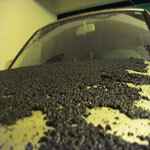 It started when the Volcan Pacaya started erupting a leeeeeeettle more aggressively that normal, and began spewing ash all over the city and surrounding areas. If I’m not mistaken, this may be the same volcano that my family and I hiked up to on Christmas Day back in 2007. 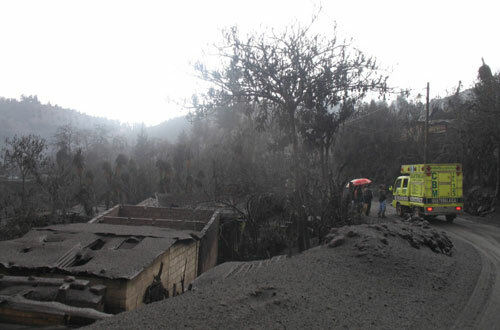 Pacaya has been an active volcano for quite some time, but it’s been a little over ten years since it was this active. 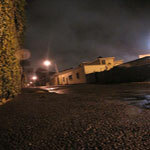 Next came tropical storm Agatha, which has killed around two hundred people in the Central American region, and left over 150,000 people homeless. 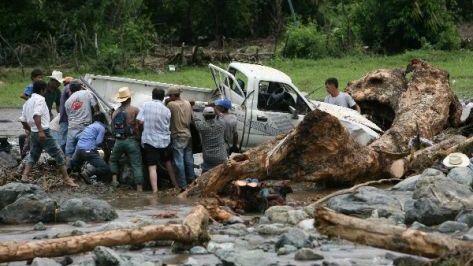 The storm caused several mudslides, as well as the overflowing of several rivers, the destruction of bridges around the area, and has left some small villages inaccessible. The people that I’ve talked to from Guatemala haven’t been severely affected, thankfully. My grandma has been back here in the US for a while, so it’s a relief not to have to worry about her safety. Apparently one of her renters had to move to the downstairs apartment, since the weight of the ash and water started causing several leaks in the apartment. My heart goes out to the hundreds that have been affected by it, however, and will continue to be affected by it until they get the help they need to reconstruct their homes and get back on their feet. The UN already issued a statement on aid it will be disbursing. 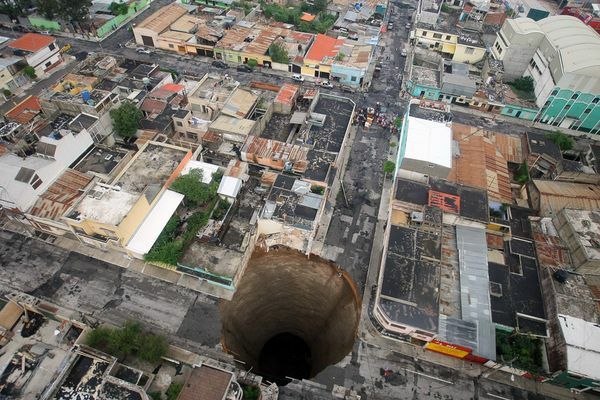 Finally, most of you have probably already heard about the giant sinkhole that opened up in the city. When this picture first came out on the web, there were rumors that it had been photoshopped. Nope. It’s real. It’s approximately 60 feet wide, and 300 hundred feet deep. 300 feet! Apparently that’s large enough to swallow a three story building, and leave absolutely no sight of it. Thankfully, most reports are that there were no fatalities, since all workers had left the building for the day. 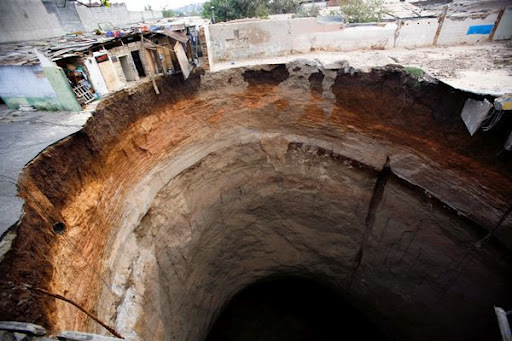 There was a similar sinkhole in Guatemala, in the same neighborhood I believe, about a year or two ago. I started doing a little research this morning into sinkholes, since I just can’t fathom how they happen. I just post the link to Wikipedia instead of boring you all with what I’ve learned about them :) I still don’t understand how they are in almost perfectly round shape, so if anyone comes across that information, please let me know. I’m posting a link to a blog that I read on the regular, a Canadian mom living in Antigua, Guatemala. She has captured a lot of pictures of what’s going on down there, as well as relief efforts in her neck of the woods. A couple days ago I realized that a new month was upon me, and you know what this means: a new opportunity to highlight an amazing organization! I was running low on organizations that I was personally aware of, and although I could have done a google search to research organizations around the world, I decided to reach out to my facebook community to see what suggestions they had. I was so happy to get suggestions from several people, and thanks to them I have found some really cool organizations that I will be highlighting over the next few months. For this month I have decided to go with Heifer International, an organization suggested by Jessica. A little bit about her: our first year in college we walked down the streets of Del Playa in Santa Barbara, arms linked, laughing about how alike we were and how we should have been twins, except for the small fact that she’s asian and I’m guatemalan. No biggie :) Turns out she’s even more awesome than I thought: she is personally involved in several charities, Heifer being one of them. Have you ever thought about buying a heifer for a family who is starving? How about a llama for a poor farmer in Peru? Maybe you’ve thought about buying a flock of chicks to donate to a family. Maybe not, huh? Well now you can. Turns out the mission of Heifer is not just to give people food, but to make them self sufficient by giving them the tools needed to help themselves. You give them something they can use to live off of for years to come, to create income and food for their home, to feed their malnourished children. And you can help. Through Heifer, you can purchase one of these meaningful gifts, or you can purchase a “share” of it if you can’t afford the whole thing on your own. How cool is that?? It gets better. If you want to go a step further, you can create your own Heifer Team to fundraise money. The website gives you all sorts of ideas on how you can raise money for the organization, so you are not going into this bling. You can also join an existing team if you do not want to start one on your own. You can also donate to a project instead of purchasing an individual gift. Heifer is involved in projects all over the world, so I won’t list them all here, but I encourage you to check out their page and see if there is any specific project that may be dear to your heart, and worth a donation. I also encourage you to check out their success stories so you can see exactly how this organization is making a difference in people’s lives. Thank you Jessica for letting me know about this great organization. I definitely look forward to contributing to it in the near future. Sooooo, story of my life, money is in short supply. As our rent was due today, it was a rough day, financially speaking. A special thanks to a little angel who helped us out big time today. There are so many things up in the air right now, that it’s hard to find stability in something. On my way to tutoring tonight I just kept telling myself: you could be worse, things could be worse. I freak out and obsess over our lack of money, but I know I need to focus on the love and stability that we have. I need to remember there are people dealing with much worse than financial troubles, and people who live off of much less than I do. So maybe we need to downsize, so what? People live with less. People live. And these people are happy.